Although I uploaded my photos of the Welshpool & Llanfair gala to my Flickr account soon after the event, it’s taken until now to find time to sit and write about it. The railway’s annual gala is usually held at the start of September, and it’s an event I’ve been meaning to go to for a little while now. This year it coincided with a visit to my parents, who live only an hour or so away, so my Dad and I headed over there first thing on a Sunday morning to try and cram in as much as possible before another appointment in the afternoon. We didn’t plan to take the first, double-headed train but fortunately reached Llanfair just in time to see it depart. Both of the W&L’s Beyer-Peacock locos, Earl and Countess set off for Welshpool with the reproduction Pickering coaches and a selection of goods wagons. 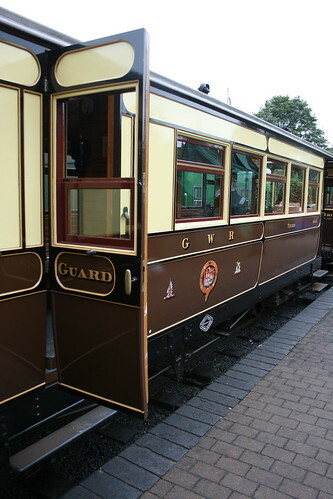 This was the first time I’d seen the new coaches up close, and they are beautiful pieces of craftsmanship by the Ffestiniog Railway’s Boston Lodge works. There was a bit of time before the next departure to have a nose around Llanfair yard as the other steam engines were being prepared. 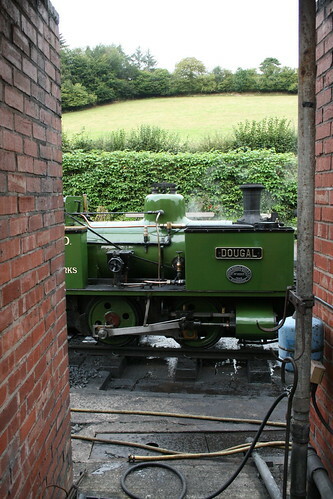 In contrast to the railway’s usual quiet character it was a hive of activity, with Dougal pottering about, No. 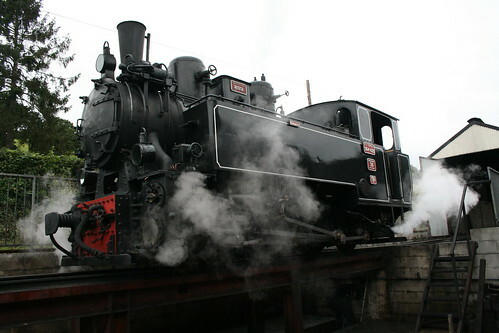 14 and the recently acquired Romanian Resita loco raising steam, and diesel Chattenden shunting. 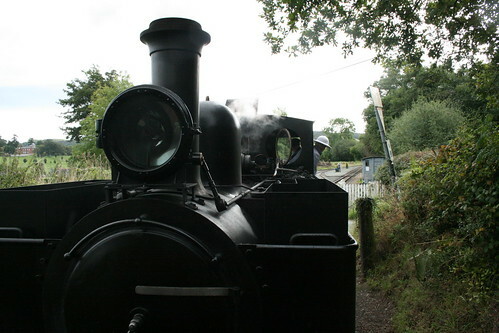 In order to get the most variety from the day, our intention was to take a short return trip behind Dougal down to Cyfronydd, and then a journey along the whole line later on. I was a bit worried that “limited capacity” on Dougal‘s train would be a problem (in fact it was just one small coach!) but in the event most of the morning services were quite lightly loaded. 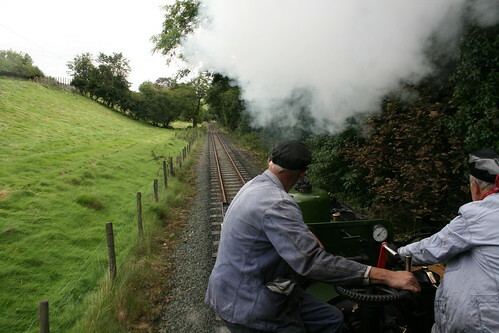 Dougal gave a spirited performance on the run up to Cyfronydd, standing on the coach balcony right behind such a small engine gives a unique (and smoky) view of the line and so we chose the rear balcony on the return trip which allowed a more relaxed study of the scenery. At Cyfronydd there was a chance to examine the loco up close, and also see the Resita pass by on its first journey to Welshpool. Back at Llanfair there was a short wait before the departure of the ex-Sierra Leone Hunslet No. 14. 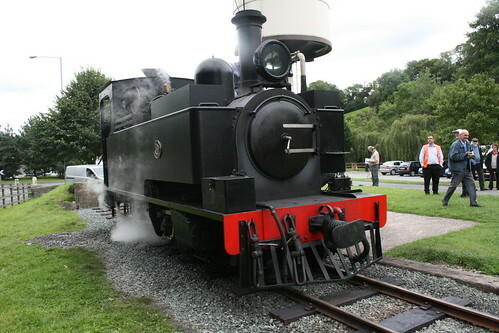 The Hunslet is due to go out of service shortly when its boiler ticket expires, and for the occasion it had been repainted into plain matt black – the livery it had worn on arrival at the railway in the 1970s. Paired with the recently restored Sierra Leone coaches it would form the “African train” later in the day, with the crew getting into the spirit of things by wearing pith helmets on the footplate. A coffee break at Welshpool was the perfect opportunity to take a load of detail photos of No. 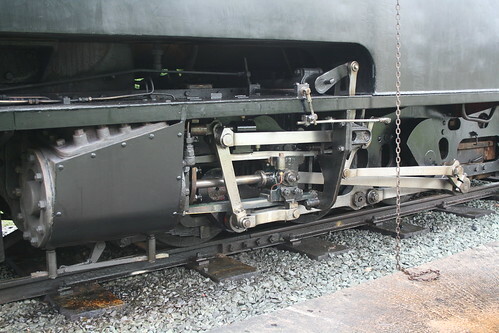 14 before it is withdrawn. Perhaps the plain black livery will be a good choice for my modelling projects, although the amount of potential alterations I could now make to the OO9 kit is somewhat daunting. A final journey back along the line to Llanfair behind the venerable Countess rounded off the visit, although not before the sight of the Drewry inspection car known as The Wasp head off on another trip to Cyfronydd with a full payload of 12 lucky passengers. The furry dice in the windscreen was the perfect little touch. 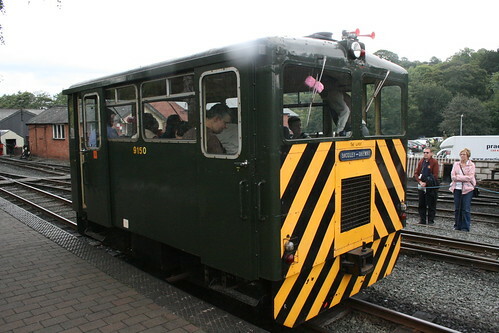 The main shed at Llanfair was open for visitors, and contained a number of interesting items including the railway’s ballast tamper – obtained from a South African gold mine – and a lethal-looking drasine device which must give the ultimate open-air narrow gauge experience. I’ve only shown a small sample of photos on this post, there are plenty more in the Flickr set if you want to take a look. 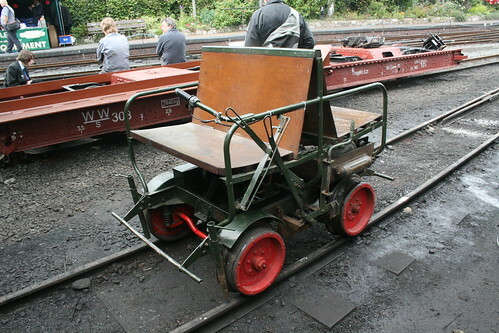 This entry was posted in 2' 6" gauge, inspiration, narrow gauge, photos, preservation, wllr. Bookmark the permalink.